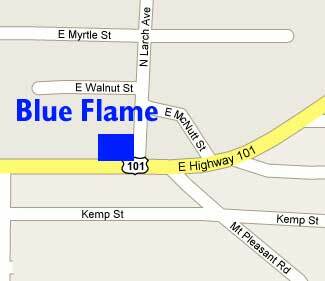 Blue Flame Barbeque is not closed as we had feared. They are moving to a real, indoors location right across the street on Route 101, just east of Port Angeles. We loved them at their old location with its outdoor smokers, and we are looking forward to trying them out when they reopen as a real restaurant. 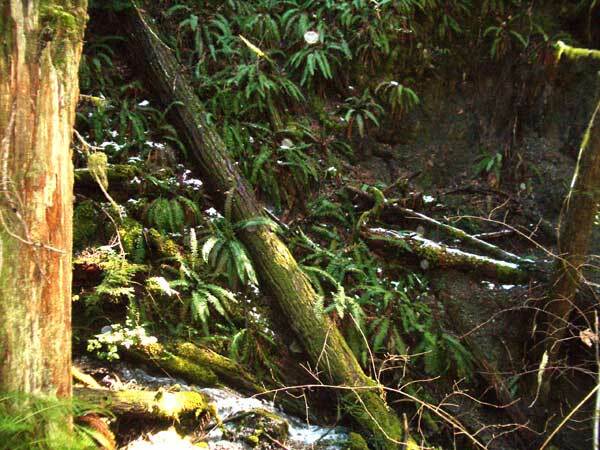 We were out at the Hoh Rain Forest yesterday, and the views of the snow covered mountains were spectacular as you can see from in the picture on the left. We have never been that far up the river this early in the season, at least not when the mountains were still snow covered. The trail was passable to Five Mile Island, but there was a lot of wind damage. 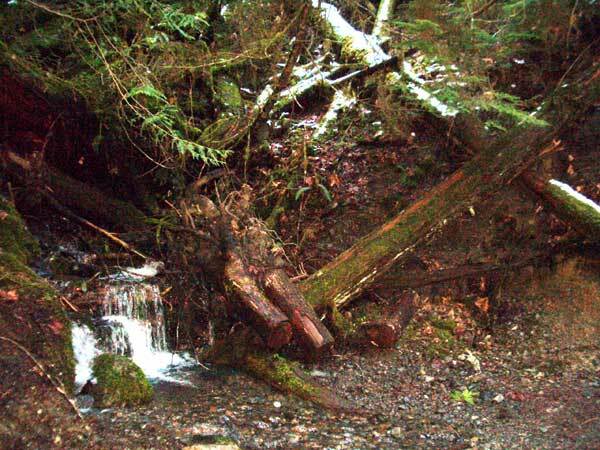 Some pretty big trees were down, some blocking the trail. Bushwhacking wasn't that hard, but we had to do some clambering and thrashing. For more pictures of downed trees, the snow covered mountains and the elk herd we saw, see our special photo report. We've tasted our first salad greens of the year from the Port Angeles Farmers' Market. We'll keep you posted as the season progresses. 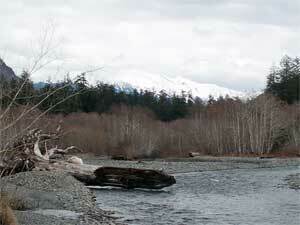 We've been hiking the Elwha Trail from Whiskey Bend a fair bit this winter. Most of our favorite high country hikes are under all too many feet of snow, and the avalanche danger is way too high. They are also rather cold and uninviting. 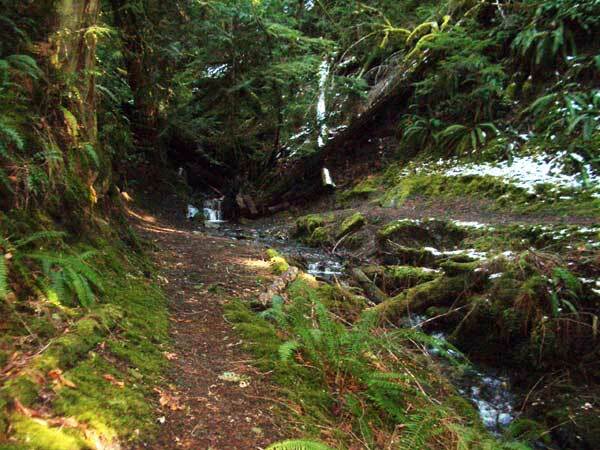 In contrast, the trail out of Whiskey Bend has been generally accessible, and the views of the river better than ever because of all the trees and branches knocked down by the wind. Judging by the fallen trees that have been sawn, and the trailside earthworks, the park service has been doing some maintenance on this trail since our last visit. There was no snow on our last excursion, but this time we caught the tail end of the storm. 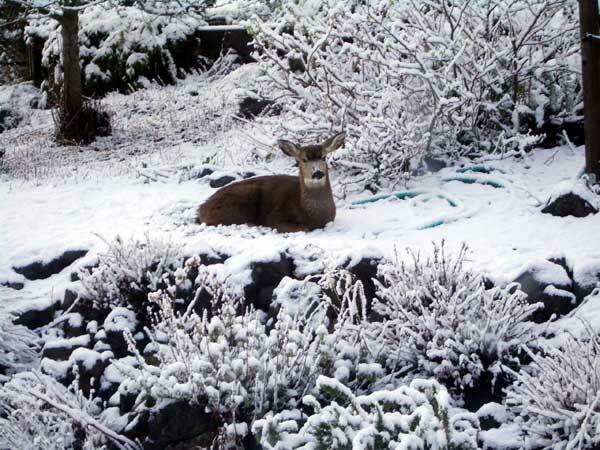 Right now, we don't get all excited about deer in our yard. There isn't all that much for a deer to eat in our garden at the moment. We're still cutting back the old roses and pruning our fruit trees, at least when there isn't quite this much snow on the ground. So, behold the backyard menace, lurking like a lean Assyrian and waiting for the Kaleberg garden bounty. We've been putting off posting this, since it is kind of a downer. We've been big fans of the Port Angeles Farmers' Market for years, even before it moved downtown. Then, we were even bigger fans after it moved downtown, since we almost never got downtown, except to have dinner at Bella Italia, visit Port Book and News, or see a movie at the Lincoln Theatre. Now we had an excuse to shop downtown, and we did. Let's face it, downtown Port Angeles is dying, what with a Walmart a bit to the east, Sequim, even further east, turning into a down market mega-mall, and the changes in the lumber and fishing industries, the traditional mainstays of the town. There are some great 19th and early 20th century buildings downtown, but all too many empty lots and closed stores. The Farmers' Market brought us, and many other shoppers into town. There were even a few businesses that chose their locations to take advantage of the market, and now we'll see how well they do. While we may have liked the Farmers' Market, it apparently bothered a small group of local merchants, even though there were many merchants in favor of it, and others who didn't care one way or the other. These anti-market merchants seem to have gotten stuck back in 1952, but it's not 1952 anymore. 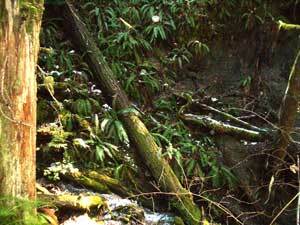 The big timber is gone, and one man with a chain saw and a self-loader can do the work of an entire team back then. Rural downtowns have to compete with their own suburbs, and everyone owns a car. If they don't find what they need in town, they can drive to Sequim, or Silverdale, or Seattle, or whatever. Some will even shop on the internet. Rather than embracing the Farmers' Market and the foot traffic it brought, these merchants felt that it interfered with their ability to park in front of their own stores, that it interfered with what little traffic flowed along the truck route through downtown Port Angeles, and quite possibly that having spent their money on a head of cabbage, few people would still be able to afford any further shopping. In any event, there was some politicking. There was the Port Angeles Planning Commission meeting that ran into the wee hours. There was the shutdown, more politicking, a reprieve, and then the market was moved back to its old location at the Courthouse, as shown on the map above. We like this location too, and we'll be there most Saturdays. There is lots of parking near the Courthouse, and it's a bit closer to our house. We often walk down the block to the big Safeway on Lincoln Street to buy what we can't get at the Farmers' Market. But, we don't get downtown as often, and we don't spend as much money there. We were back at the Dungeness Spit recently and we saw something we haven't been seeing much this winter. The beach is back. Low tides are happening during the daylight hours again, and they are real low tides, not the little winter dips. There are some good tides coming up on March 21st and 22nd, and then from April 1st to April 4th, which is especially nice since that includes the weekend. 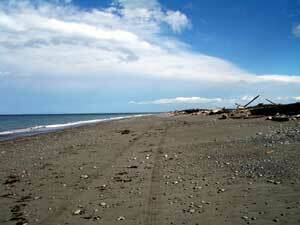 In fact, the weekends of the 1st, 15th and 29th of April are all good Dungeness Spit hiking days. For more, check out the tide tables or, if you are a Mac user, our Dungeness good tides iCal calendar. 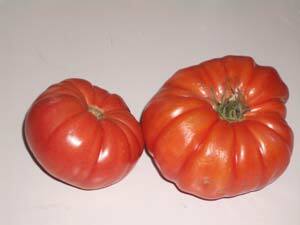 We had heard about Ugly Ripe tomatoes, so called because of their wrinkled appearance. They are known for their taste and for being banned for export from the state of Florida where they are grown. We found these organically grown Ugly Ripes at Nash Huber's farm stand, and we have to admit that they are a bit ugly, but they are indeed delicious. They have a meaty texture and are nice and tart. Apparently, being organic, they are not subject to the same export restrictions as regular tomatoes. Most tomatoes nowadays are genetically modified to taste better, and they do. Even inorganic tomatoes are much better than the old box car tomatoes developed in the 1950s to be safe from "anything but a direct hit". These Ugly Ripes are even better than the premium supermarket brand, so we are looking forward to seeing more of them during the off season. One day we have to learn how to use the panorama mode on our digital camera. Either that, or they have to produce an Olympic National Park special camera with 8 megapixels with an 8 to 1 aspect ratio. That's Storm King as seen from across the lake, and it is mysterious and brooding. The higher resolution image you can view by clicking on the image above is all soft, discrete cosine transform ready gradients, so it should load real quickly. Thank you, all you joint photographic experts from the Joint Photographic Experts Group (JPEG), not that we have anything against the joint photographic experts from High Times. We've seen a lot of web sites lately that are into "cat blogging", or even "ferret blogging", but we don't have any cats or ferrets. 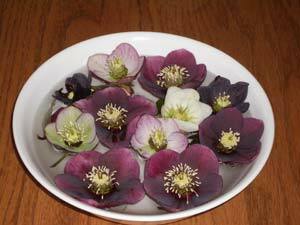 The animals around here don't like to sit still and get photographed, so instead, we've decided to photograph some of our favorite winter blossoms, hellebores. This is the 2006 batch. We really have to get a nicer bowl for them. 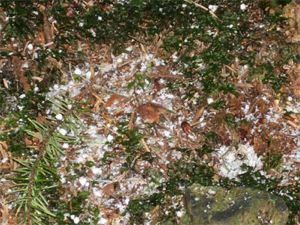 That Christmassy shot to the right is a close up of some of the hail pellets that put the kibosh on our hike up the Lake Angeles trail recently. 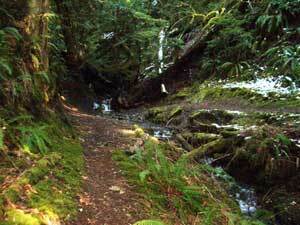 Needless to say, the trail was beautiful, but the trail of hail was as slippery a trail of ball bearings. We considered cleats, or at least our slip on Yak Tracks, but some parts of the trail are pretty steep.